i have in pdf format the entire service manual for our awesome 3g tl's if anyone wants one i do not mind sending one to you guys to share with the community. i am not selling trading bartering or accepting any forms of service or trade off for this as i dont want to break any rules. i wont turn down a mutual gift from anyone though lol but like i said im not asking for anything for this im just doing it because i know its rare to find free and expensive to buy. just giving back for all the great advice everyones given me over the years. moderators if his is in the wrong section please move it or keep it active till i can copy and repost. not sure where to put as its not selling or trading or anything so didnt think it belongs in black market. I think they're already around here somewhere. You're best off using some kind of file hosting site (Google Drive, dropbox, etc) to hold it there publicly and then post a link here. I have found it in several different theads on this site but I can't get them to work. I would love if I could get it from you. When the box asking for a username and password pops up just close it and click download again. Thanks thoiboi been looking for a 07-08 manual for the longest! no problem! If you want to share with everyone, let me know and i can send you a link to upload it there! THAT'S how you contribute to a thread! Indeed the Helms Manual there is password-protected. The other two are fine. I wonder if the password is known. I've been thumbing through it without issues. Where are you getting a prompt for a password? Right-click, properties, unblock, apply, OK? EDIT: It's accessible without a password seen in second pic, what else do you want to do with it? Last edited by MonkeyTrucker; 07-29-2015 at 01:22 PM. Ha, funny. Acrobat indeed opens it just fine. I was using a different client on Linux, and there it wanted a password just to open it. Thanks. I see, performing a conversion now to remove the "security," will post back if successful. FYI - The 04-07 is "secured" as well. Last edited by MonkeyTrucker; 07-29-2015 at 02:56 PM. Special thanks to MonkeyTrucker for converting to a version with no password. I've uploaded new copies to the Dropbox. If anyone has newer versions they'd like to share, PM me! Good stuff. Thanks for posting up! So..... Apparently this is why people don't use Dropbox.. I just got an email saying my Public links have been suspended due to "generating excessive traffic".. Hang tight while I try to find a suitable alternative..
thanks....just worked for me on Dropbox. btw, still working on that DRL problem that you sent me the electrical diagram for. I think that the module up under the dash has a bad connection. I may just live with it since getting in there with my back is almost impossible. Thanks for the download! Any chance anyone has the Acura TSX 2006 Service Manual? Thanks. BTW your contribution even for a TL Service Manual is great! close friends of mine are TL owners (3G) and they appreciate it. Much thanks to thoiboi for the file! I downloaded the 2004-2007 service manual and made some enhancements. It is now text searchable and the file size is greatly reduced. Here is a link if anyone is interested. You Sir are an answer to my prayers, thank you. if you would please tell me what to do to download this manual. Thank you. I was able to download the manual that I needed. Now I will be able to troubleshoot my AM radio. Hey Mike. I have a copy I'd be willing to host for you, for free. Shoot me a private message. 2008 TL - Torque Spec for VTEC Spool Valve Assy? 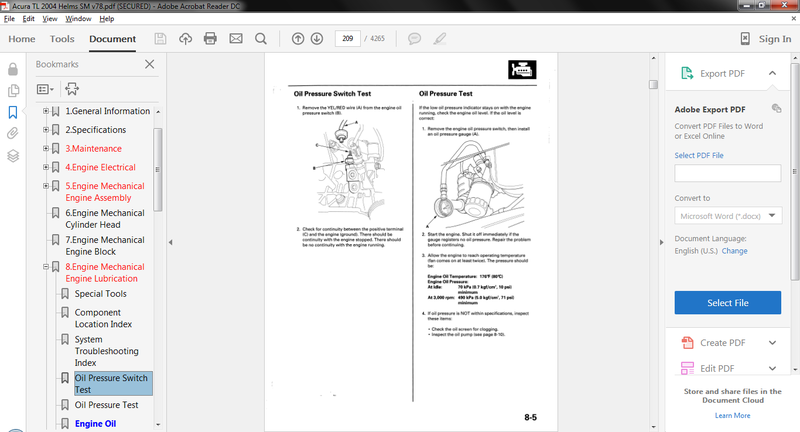 I downloaded the the 2004 TL shop manual ( the 2008 wasn't available) a few years ago and really never used it. The car is a daily driver and has been rock solid. I now have the P2647 dtc and purchased the Spool Valve Assy from Bernardi's for $160 including shipping - local dealer wanted $220 including tax. My question is regarding the torque spec on the 3 bolts holding the assembly to the block. In the 2004 manual it is 12 ft-lbs. I would assume it is the same for the 2008 as well - but I'd rather not be guessing! Can someone please confirm the correct torques spec. Thanks so much! Front seats removal and disassemble.